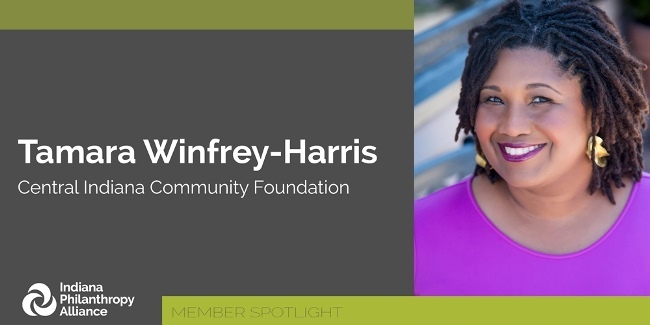 Tamara Winfrey-Harris is the Vice President of Marketing and Communications at Central Indiana Community Foundation (CICF). As a part of our new Member Spotlight series, Tamara told us about herself and the rewards of finding a communications career that incorporates her knowledge on race and gender. CICF is one of several community foundations aiming to tackle the growing gulf between the affluent and poor; inequitable economic mobility; and the profound impact of race on access to opportunity. This work is so important that CICF has changed the mission that guides its community leadership: We want to harness people, ideas and investment to make our community one where everyone has the opportunity to reach their full potential—no matter their place, race or identity. I have the enviable job of telling the community (donors, partners, not-for-profits, stakeholders and partners) about the work happening at CICF. That means my team and I handle media relations, advertising, marketing, web and social media, collateral development and design, messaging and writing. This work can include anything from developing a Powerpoint for an annual meeting to pitching a feature story to local media to producing CICF’s monthly podcast, For Good. The work I’m engaged with at CICF is, by far, the most challenging, rewarding and transformative of my career. I get to lead efforts to communicate our new direction, but also, for the first time, I get to bring my other skills to the table. I’ve long written about race and gender in places like The New York Times (https://www.nytimes.com/2018/06/16/opinion/sunday/black-midwesterners-trump-politics.html), New York magazine, Cosmopolitan and other outlets, but I’ve never had the opportunity to bring that knowledge to bear in my work as a communications professional. Now, I can. It is truly an honor to be a part of this team. What’s your favorite on-screen guilty pleasure? Where are you on the introvert/extrovert scale? I am an introvert who can fake extrovertedness really well. I am at my happiest in my bedroom with a book. I always reading about three things at once. Right now, I’m listing to Richard Reeves’ Dream Hoarders: How the American Upper Middle Class Is Leaving Everyone Else in the Dust, Why That Is a Problem, and What to Do About It on audio. (CICF is partnering with The Economic Club of Indiana to bring Reeves to Indianapolis next spring. His work with The Brookings Institute is fascinating.) On my nightstand I have When They Call You A Terrorist by Asha Bandele and Patrisse Cullors, and New Power: How Power Works in Our Hyperconnected World--and How to Make It Work for You by Henry Timms and Jeremy Heimans. There was a presentation on new power at the annual Community Foundation Opportunity Network conference last month. I’m excited to tuck into this book.